But I love my partially-crested Euphorbia lactea. When I bought it, the non-crested part of the plant was only about three inches taller than the crest, and was unbranched. Four years later, now it is 16 inches taller, and has several "arms." (The crest has gotten a bit taller as well, but not very much.) Overall, the plant is about 22 inches tall from soil level to the top of the tallest stem. Same plant. This picture is taken at a slight different angle, more accurately showing the relative sizes of the crested and regular portions of the plant. I love this plant not only because I find it beautiful, but because it is relatively carefree. I put in a sunny window in the winter and outdoors most summers. (It didn't go out in the summer of 2009, and is none the worse for having been a strictly indoor plant for more than a year now.) I water it when it is dry, and I haven't repotted it in at least two years. The only problem I've ever had with it was in the summer of 2007, when I didn't do a good job in acclimating it to the sun outdoors, and it got sunburned. I thought I was going to have an ugly plant from then on, but it recovered with just a scar or two, which aren't visible from most angles. Close-up of the crest. A sunburn scar can be seen on a stem in the background. More detail can be seen in all three pictures if you click on them. There is another thing that pleases me about my plant: At a nursery last year, I saw a partially crested E. lactea, about the size of mine, but not as attractive, priced at $35.00. I'm pretty sure I bought my plant for around seven bucks. It's silly, I know, but I get a kick out of the idea that I can raise a plant to be something that would be more valuable than what I started with, at least to someone. Thank you Karen715 for sharing. 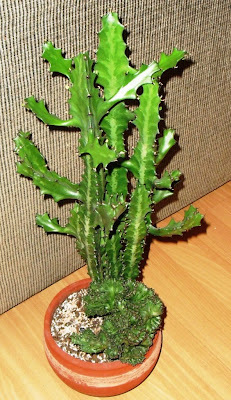 Your crested Euphorbia is lovely. I love euphorbia family. I have my crest in bonsai dish, the dish complement the crest plant nicely. I water mine twice a month and they always look good. Thank again for the lovely photos. 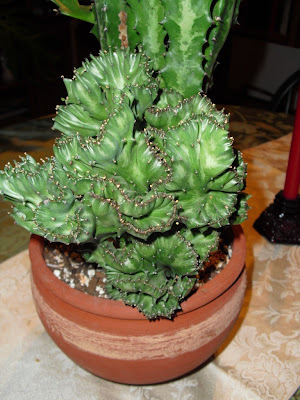 Your Euphorbia lactea really is special. I find it to be extremely attractive with that crested part there too! Totally awesome...I'm sure someone (like me) would be happy to pay even more than 35 dollars for it...even though I am quite sure you would never part with your baby!! !